I have seen Merle Norman cosmetic studios in various towns I’ve lived in growing up, and never knew the story behind the name. It turns out that Merle Norman is a company that has been around forever. It was founded in Los Angeles in 1931 by Merle Nethercutt Norman and continues to be a leading brand in premium skin care and cosmetics. Merle was one of the first women in cosmetics and an inspiration to women at the time to be self-sufficient business owners. She is even responsible for the concept of “Try Before You Buy.” She figured if she could just demonstrate her skincare products by offering a makeover she could persuade customers. Today, Merle Norman studios are located not only in the United States, but also throughout Canada and seven countries throughout the globe. The company is still run by the Nethercutt family and prides itself on manufacturing almost all of their products in the United States. The Merle Norman Pink Grapefruit Sugar Scrub is a 2014 winner of the Self Magazine’s Healthy Beauty Award. This body polisher is made with real sugar granules and lathers into a foamy scrub to gently polish away dry, dead skin. It also contains antioxidants to protect the skin and Sweet Almond Oil to help moisturize. Their Pink Grapefruit Body Butter uses Shea, Murumuru Seed, and Palm to follow up the Sugar Scrub with ultimate skin hydration. Antioxidants soothe and condition to help nourish the skin. I’m always a little weary of grapefruit or citrus scented bath products because for some reason I feel like it’s very easy for them to smell like body odor. Is that just me? Merle Norman got it right on these products as the smell is really pleasant and the scent stays with me for a while after applying each one. The combination of these two products leaves my skin feeling really soft and moisturized. I like how the Pink Grapefruit Sugar Scrub exfoliates and lends a nice foamy lather at the same time. The Pink Grapefruit Body Butter goes on evenly without being too light or too thick. I don’t feel overly greasy after applying the body butter either. And just a little heads up- the Pink Grapefruit Scrub and Body Butter are an awesome way to pamper tired hands and feet when winding down at the end of a long day. For more information on these products visit merlenorman.com. While you’re there you can also use their search tool to find a Merle Norman studio near you. Check out Merle Norman on Pinterest and Facebook to see all their great products up close and personal. I’d love to try this! 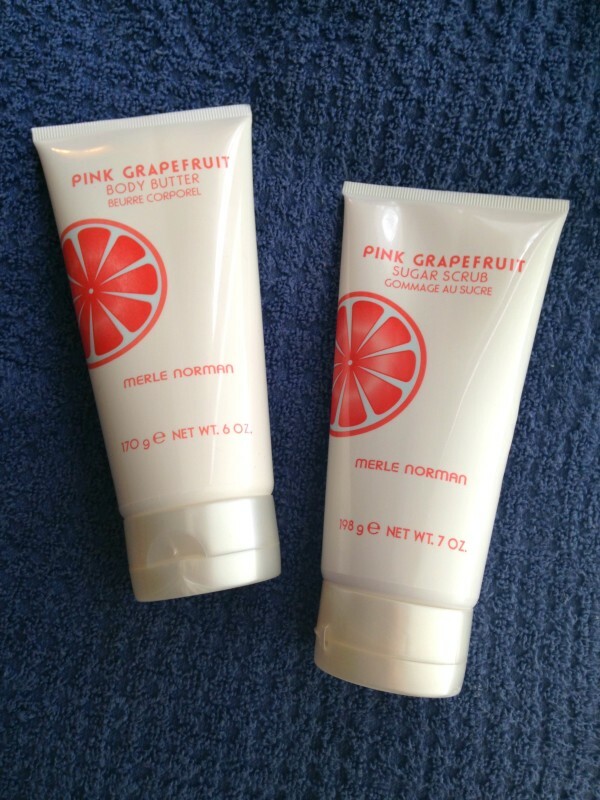 Pink grapefruit is one of my favorite scents!